Good oral hygiene and regular dental care are important parts of a child’s health. According to the American Academy of Pediatric Dentistry (AAPD), between 40-50% of children will be affected by tooth decay before age five. The AAPD recommends that children have their first visit to the dentist by their first birthday. 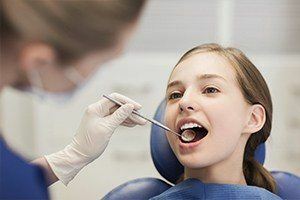 Finding a dentist who is knowledgeable and experienced in pediatric dentistry is the first step in establishing and maintaining good oral health for your child. Choosing a family dentist that your kids will actually like and look forward to seeing is equally important. Our Aegis Dental office places a strong emphasis on making sure that your child’s first dental visit is a fun, relaxing, and pleasant experience that sets the tone for how they feel about visiting the dentist for the rest of their lives. Here, everyone is welcoming, friendly, and relaxed. Dr. Chandy is warm, gentle, caring, and loves to work with children. Being a mother of three kids herself, her warm, engaging personality makes her the perfect kid’s dentist. 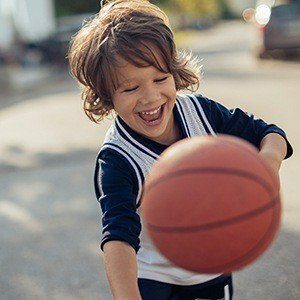 Of course, the unknown always feels a little challenging for kids — not to mention adults – but kids are also naturally curious, so Dr. Chandy and her team always take the time to explain anything unfamiliar, answer any questions, and allow a child to explore and actually have a fun and interesting time. With Dr. Chandy, our friendly staff, and parents all working together as a team, we can create a very positive experience for your child’s dentist visits and foster lifelong habits that provide excellent dental health. Thorough brushing and flossing help remove food particles and plaque from the smooth surfaces of the teeth, but toothbrush bristles cannot reach all the way into the depressions and grooves to extract food and plaque. Sealants protect these vulnerable areas by “sealing out” plaque and food. Sealants are very easy for your child’s dentist to apply. The sealant is painted onto the tooth enamel where it bonds directly and hardens. This plastic resin bonds into the depressions and grooves (pits and fissures) of the chewing surfaces of back teeth. The sealant acts as a barrier, protecting enamel from plaque and acids. As long as the sealant remains intact, the tooth surface will be protected from decay. Sealants hold up well under the force of normal chewing and may last several years before a reapplication is needed. During your child’s regular dental visits, their dentist will check the condition of the sealants and reapply them when necessary. Fluoride is a mineral that occurs naturally in all water sources, including oceans, lakes, and rivers. Research has shown that fluoride helps prevent cavities in children and adults by making the teeth more resistant to the acid attacks that cause cavities. Fluoride is nature’s cavity fighter, helping repair the early stages of tooth decay even before the decay can be seen. Topical fluoride is the type you receive at the dental office or when you use dental products such as toothpaste or mouth rinses. Systemic fluoride is ingested, usually through a public water supply, which in the United States applies to nearly 74% of the population. While teeth are forming under the gums, the fluoride taken in mostly from drinking water and other beverages strengthens the tooth enamel, making it stronger and more resistant to cavities. This provides what is called a “systemic” benefit. After the teeth erupt, fluoride then helps rebuild (remineralize) weakened tooth enamel and reverse the early signs of tooth decay. To schedule your child’s next dental appointment, please call 972-492-6700.